New heatery from H3 artists Crossword and MC FÜBB feat. artists Cada Bug and Shake LaBomba from Chicago. Check more info below! Two days, two nights, two banging tracks. This past summer, Crossword and MC FÜBB (The Cypher, H3/Hip Hop Headz) took a road trip from Toronto to Chicago. While the main focus of the trip was to bring Toronto-based event The Cypher down to the windy city, the two emcees also linked up with studio engineer John Randle at JDR Sounds. The first recording session went so well that FÜBB and Cross came back the next day to lay out another track. The end result: the Toronto artists banged out two joints with Chicago artists they'd never met prior. The products of their collaborations are unleashed in Toronto 2 Chicago (aka #TO2CHI), a hard-hitting double single release that bridges the distance between artists in the two great cities in the name of creating high quality hip hop music. 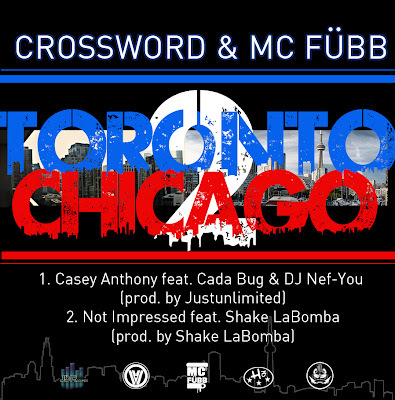 The two track release features Chicago emcee Cada Bug and Toronto's DJ Nef-You on "Casey Anthony," a high-octane track with a murderous beat produced by TO's Justunlimited. Producer/emcee Shake LaBomba rapped on and provided beat for "Not Impressed,” on which all three artists spit diverse flows over a 6/8 timing instrumental (an atypical meter for hip hop music). In a musical era where monotony and lacklustre quality are commonplace, Toronto 2 Chicago raises the bar by infusing a fresh dose of creative production, original lyricism, distinctive flows and raw hip hop flavour for astute listeners worldwide. Recorded by John Randle at JDR Sounds (@JAYRAN20). Mixed and mastered by Phame at GameTyme Studio (@PhameOne). Project cover art design by Olivia Allen (@liv_allen).